Found at the excellent music hosting service of SoundCloud. A couple of weeks ago Spotify was released in the Netherlands. After trying to find all my old cassette tapes on there – with only a 50% success rate – , i turned my attention to Scritti Politti songs. Most songs are very easy to find, simply do a search for Scritti Politti. A surprisingly large amount of results, including most 12″ releases and remixes, the Mastermind Turntable mix, A world come back to live, Dead Certainty and the Nice up the area mix of Take me in your arms and love me, one of my personal favourites. A couple of collaborations are harder to spot. The L is for lover performed by Al Jarreau, Love of a lifetime by Chaka Kahn. Wrap it up of the Eurythmics and Someday of Kylie Minogue is in the spotify collection as well. Even Turn on red by David Gamson! Sadly i couldn’t find I don’t know why i love you. If you want to experience a severe scritti overdose, vastly superior to the upcoming Absolute best of compilation, check out the Scrittipalooza playlist! I have always been a huge fan of Chaka Khan. She sings high and very loud, a combination which is a serious killer for most singers. Years ago when I was working on an album with Dave Green (yes, I know! ), a former band-member of the UK-band Icicle Works, we had a discussion about Chaka. Dave asked me if I had ever heard Chaka’s ‘Naughty’ album. And no, I did not. I think it was only officially released in Japan or something like that. 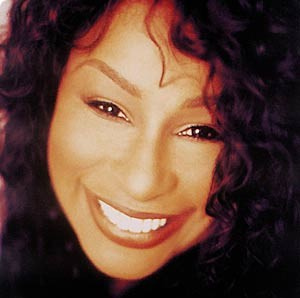 But anyway: ‘Naughty ‘ (buy at Amazon.com) is the best Chaka has ever done. Gives me chills all over! He is also finishing writing a song for Chaka Khan, called ‘Love Of A Lifetime’. It is the first he’s written for somebody else, and he will sing on it with Chaka and co-produce it. Chaka had contacted Green and asked him to do it. They have met previously and Chaka likes the Scritti stuff very much. The thing that still does it for me is the way the song modulates from the intro into the verse and then finally into the refrain. My head is still popping off when I hear it and I am sure the same thing happened to Miles Davis. Miles did a cover of Perfect Way on his album Tutu. Lots of effects and remixing tricks, typical 80’s stuff, but still a cool mix. An interesting remix, monoish sounding (maybe caused by a ‘not so Perfect’ file-conversion? ), but with a few interesting twists. This is a very interesting one. It fooled me. At first I thought it was the original version but it’s not. The mix is different. I have not A/B compared it to the original version yet. Would be something for an interesting discussion I guess. Just leave your comments below! Bibbly recieved this intricate remix of The Word Girl from Free Moral Agent. I’ll give you some clues on this mix as far as samples. All of the musical elements in this mix is derived from sounds from the song “The Word Girl”, just manipulated in certain ways: The main keyboard sounds are sampled from the end of the song, before the piano ending: I also used the vocoder at the end also for more displacement of format from the original tune: The only instrument not directly from the song is the sub-bass and a patch I created with FabFilter. Guitar is sampled from the song as well. Who has created this? We don’t have a clue. If you know more, please add your comments below!